Datong is a city in Shanxi Province, China. Datong is a small city with little experience with foreigners. People here are friendly and curious, and will definitely stare at foreigners. For simple entertainment, stop at a chuanr (meat on a stick) stand near Red Flag square, or Red Flag square itself and chat up the locals. Datong itself doesn't contain much to do, with many 'historical' sites currently under construction, but makes for an excellent base for visits to the surrounding attractions. As of Summer 2016 the city is still covered in building sites, especially inside the recently constructed city wall. Beijing - 4.5hr. Buses depart every hour from the Liuliqiao Passenger Transport Hub (Liuliqiao Long Distance Bus Station 六里桥客运主枢纽) in the south-west of the city. To get there, take exits C or D from Luiliqiao Subway station (六里桥), which is on subway lines 9 & 10. Tickets are bought in the Transport Hub ticket office, at a cost of cost ¥133, and buses usually depart from gates 4 or 6. The journey is on very good roads, and includes a 20 minute comfort break about half-way as there are no toilets on the bus. Hohhot - Buses depart from Hohhot's bus station (next to the train station) regularly all day. Just turning up and buying a ticket should usually get you on a bus within an hour, two at most. The journey takes about 5 hours with average traffic conditions, costing c57. The buses terminate at Datong main bus station (a short taxi ride from the train station). Wutai Shan - Three buses a day in summer from Wutai Mountain from 8am to 1pm. Booking tickets at the Datong train station can be difficult for popular directions so book tickets from Datong as early as possible. Beijing - 6 hr. Daily overnight trains run from Beijing to Datong and back. A hardsleeper ticket costs around ¥108. Night trains are available from both Beijing West Station (Beijing Xi Zhan) and Beijing Station (Beijing Zhan). In addition to the night train, there is a daily morning train, starting at 8:50AM and ¥54 for a hardseater. Xi'an - overnight train, approximately 17 hr. Train leaves for Xi'an at 4:40PM. Hardsleeper (as Sep 23, 2010) ¥217. Beijing - 1 hr. Reasonably priced but expect early mornings. Bus 4 - runs from the train station into town (6th stop (四牌楼）for 9 Dragon wall, 7th stop (清远街, bus sign “青年宫”) for Huāyuàn Monastery and Youth Hostel , 8th stop (红旗广场）for Red Flag square. The final stop on bus line 4 is the start of bus line 3. Bus 3 - runs from the Xinkaili bus station (final stop of bus 4) to the Yungang Caves (end of the line). Bus 30 - runs from the train station all the way to the south bus station (新南客运站), the last stop (45+ mins). Buses within Datong are ¥1. 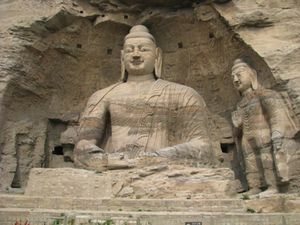 Trips to the Yungang Caves are ¥1.5. Fares start at 7rmb and then increase in 1.6 increments. You can get around everywhere in the city itself for less than 10rmb, taxi drivers will happily take you further afield. It may be convenient and less stressful to hire a taxi to visit the main sites out of town. A trip to the Hanging Monastery and Wooden Pagoda (both out of town - this is about 5 hours travel time) for 2 people cost for ¥400 in June 2016, with the driver waiting for us at each site. It is possible to do this for cheaper but for convenience and speed (plus stops to stretch legs at interesting places such as cave houses and dragon screens en route). If you find a good driver it is worth arranging for them to take you on your other trips as this can save time and money arranging something else. You can try to find a taxi yourself (eg in front of the train station in the morning there may be taxi drivers seeking this business) or ask at China International Travel Service (CITS, +86 0352 5101816, +86 13008088454). If asking via CITS, do not forget to ask for a new taxi or you may end up in an old car which is not safe for a trip out of town. Local hostels and tours may have shuttle services starting at ¥300 for the Hanging Monastery and Yungang Grottoes, and others for higher prices. 大同旅舍 Datong Highrise Hostel, 22nd floor, Unit 14, No.15 Ying Bin Xi Jie, Datong, China (emai:[email protected]; phone:+86 18636220634 Arriving by train: There are two railway stations but choose the main Datong Station. recommend that you take a taxi (red or light blue) from the street (ignore the people approaching you at the station). It's about a 10 minute drive from the station to the hostel. The taxi fare should be around 20 RMB. Show the taxi driver the following address: '大同市迎宾西街15号（桐城中央）商业楼22层，靠近魏都国际大酒店，电话18636220634'，停在海宇画室的招牌下就可以). 91RMB/simple dorm, 160RMB/deluxe dorm, 300RMB/private room. edit If you are very lucky he will know it. Tip: the street Ying Bin Xi Jie is a new name and so far has not been reflected on street signs which still only have Ying Bin Jie. 青年旅社 Datong Youth Hostel, "华严街 (Before 8:30pm take no. 4 bus (¥1) from train station 7 stops to 清远街 Qīngyuǎn Jiē for Huáyán monastery. [ Get off bus and walk forwards 200m, cross road and enter ancient area under arch (Fang Gu Jie) first passing Huáyán monastery on your right and then Fang Gu Jie carrying straight on. In less than 5 minutes you come to a sign on the right saying Datong Youth Hostel, go in through children's clothing shop), . edit(Note: Check Google maps or similar before arriving or take a taxi. The listed bus route was slightly incorrect at late 2012.)) This is a small, busy youth hostel opened in May 2011 in a central location. Views from bedrooms over the renovated old town. Booking by email is advisable. [email protected] Not all staff speak English although more can read it. Tel 0352 2427766. Dorms ¥50 per night (Spring 2013), members ¥45. Standard ensuite rooms (comfortable, flat screen TV, kettle, western toilet) ¥158. Free wifi+internet terminals. Laundry ¥10 per load. 通明快捷酒店 Tōngmíng Kuàijié Jiŭdiàn, No.36 站前街 Zhànqián Street (Turn left out of the train station and walk straight ahead for 5 minutes past a couple of expensive hotels and then a string of cheap Chinese hotels that are not allowed to accept foreigners. On the right is a taller red hotel with a name in red letters 通明快捷酒店 客房). Don't believe rack rates. A basement double room with ensuite can be secured for ¥100 (Feb 2011). Single ensuite ¥80 (Aug 2011).. edit This hotel offers a range of rooms, many with wifi access. Hot water 8pm-midnight? TV, kettle, Western toilet. The beds are hard, the rooms in the basement are cold and smell of cigarettes but the location may be convenient. Further down this street on the right, some other hotels might also be willing to accept foreigners at lower prices than Tōngmíng. Ming Yue Business Hotel. Prices from 100rmb (2014). Good quality modern hotel tucked behind the Home Inn. Address: 1 South Meiyuan, Yucai Lu" which is just off Yingbin Jie (Yingbinxi Jie it will become) and west of the intersection with Yunzhong Lu. Beijing - Approx eight buses a day depart for Beijing from the Xīnnán Bus Station. ¥128 ordinary seat, ¥158 luxury seat. Approx 4.5 hours depending on the traffic. A 1 hour flight leaves a couple of times a day. Wutai Shan - 2 buses per day in summer at 8:30am and 2:10pm from Xīnnán Bus Station. ¥75. 4 hours. Xīnnán Bus Station (新南客运站 Xīnnán Kèyùnzhàn) is the last stop on Datong local bus 30 that departs from Datong train station. ¥1. 45+ minutes depending on traffic. This page was last edited on 9 July 2017, at 11:39.